Cool seat pad contains heat absorbing gel which cools and sooth for hours without need of electricity or refrigeration. The seating pad has flexible design and is perfect for hot, stuffy rooms for desk workers or for use in cars. The pad prevents sweating, is nontoxic, eco-friendly and fits all seats. Ice bag is available in sizes of six, nine and eleven inches and good for back pains, sports injuries, sprains, strains and inflammation. 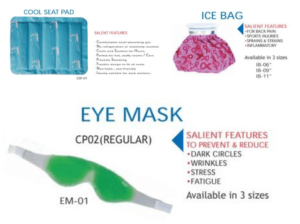 Eye mask is again available in 3 sizes to prevent and reduce dark circles, wrinkles, stress and fatigues. Night mask is also available to cover the eyes and normally used in long flights to sleep without disturbances. 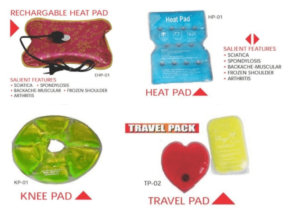 Hot n cool pad is available in various colours and comes handy for back pains, sports injuries, sprains, strains, inflammation, fever, migraine and toothache. Face mask hot & cold is available in various colours with salient features of help in reducing wrinkles, pimples, stress, fatigue and sinus. Rechargeable heat pad helps in sciatica, spondylosis, backache, muscular, frozen shoulder and arthritis. We also have regular heat pads, knee pads and travel pads to carry as part of travel packs. 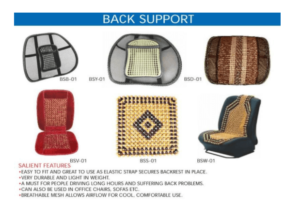 Back support has multiple choices with breathable mesh to allow airflow for cool, comfortable and can also be used in offices on chairs and sofas. A boon for people driving long hours and suffering back problems as they can easily fit as very durable and light weight. In the health related corporate gifts series, we also have full range of accu related items, massagers, yoga mats, steam inhalers, neck belt, hair brush etc. which will be covered in more details in the subsequent next two weeks. Please do revert with your specific requirements so that we can help you select the best for your target audience.